Sophomore Chrissy Delawder (Broadway, Va./Broadway) is already turning heads at the start of EMU’s women’s basketball season. Her per-game average this season is 10.9 points, up more than four points from last year. And she’s just getting started. 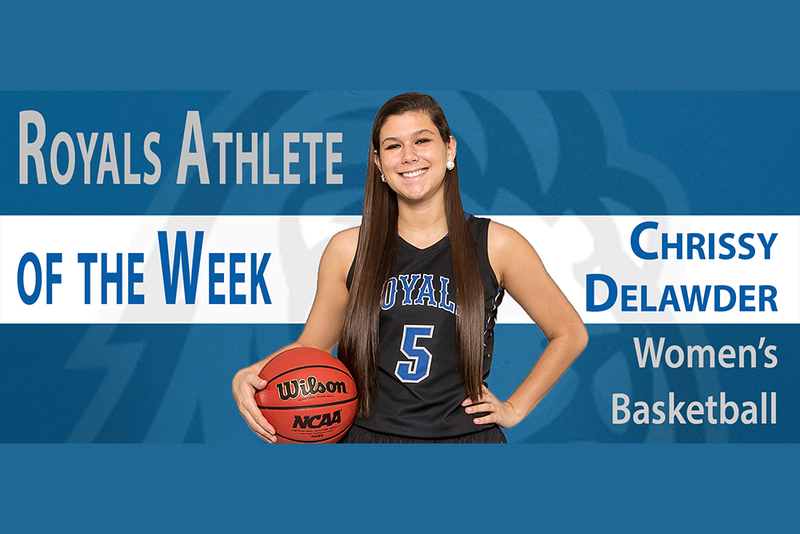 She provided the key scores in the Royals’ ODAC win against Lynchburg, tying her career-high 18 points. Delawder put in the off-season work to be well-prepared for her second season of collegiate basketball. “This past summer I did Crossfit and tried to get in the gym as much as possible,” she said. Head coach Kevin Griffin noticed her off-season dedication. With a different roster than last year, Delawder and her teammates have had to make the necessary adjustments in the role they play on the court. Delawder is an elementary education major, and hopes to teach in the nearby area after she graduates. She is also a community advisor (CA) in Cedarwood. Delawder still likes to make time for the important people in her life when she has the chance. And when she’s not doing that, chances are she’s in the gym. Delawder puts in a lot of work, but she gets a lot from her team and her sport in return. Way to go Chrissy!! I hope you have a great season.